Mars House was a large residence in Stars Lane whose extensive gardens occupied the whole of the eastern corner of the South Street / Stars Lane junction and at one time extending all the way down to Dodham Brook. The house was built before 1806 and is clearly seen on E Watts' map of that year as well as his 1831 map (both shown below). The 1806 map shows that the house and extensive lands around it were owned by Mr GR Corry. Mars House was owned by wealthy glove manufacturer and mayor of Yeovil Edward Raymond from at least 1850 until his death in 1880. Behind Mars House were what were described in 1869 as "newly erected wool stores" which were in the occupation of Raymond's son-in-law, Benjamin Chaffey. The lower left quadrant of the 1886 map below is an orchard that was also owned by Edward Raymond. The wool store would later become the premises of Ernest Farr, scrap merchant. 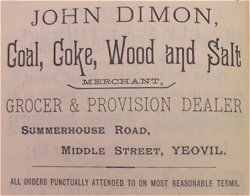 In the 1901 census 54-year old coal merchant John Dimon was resident with his wife Mary Ann, a grocer. The advertisement at left, from Whitby's Yeovil Almanack Advertiser of 1892, locates John's depot in Summerhouse Road and his wife's grocery in Middle Street. Living with them were their three daughters; Elizabeth, Ada and Gertrude who were all dressmakers, and sons Ernest, a waiter, and William, an apprentice printer. Mars House had been demolished and it and its gardens had been built on by 1911. The site of Mars House itself is now occupied by Chicago Rock and its forecourt, while the gardens fronting onto Middle Street reached from Stars Lane to about halfway across today’s Poundland. E Watts' map of 1806 shows Mars House at lower centre as a long red building facing the Triangle and end-on to Stars Lane. The attached building shaded grey was classed as an outbuilding. As well as owning Mars House, Mr GR Corry owned all the land it stood on from the Triangle to Dodham Brook at bottom right. 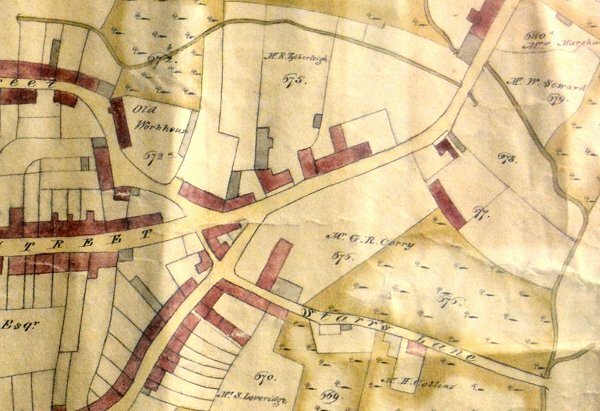 Watts' map of 1831 shows that by this time Mr Corry had sold off the western portion of the grounds of Mars House and the Wesleyan Chapel and Ebenezer Row had been built. 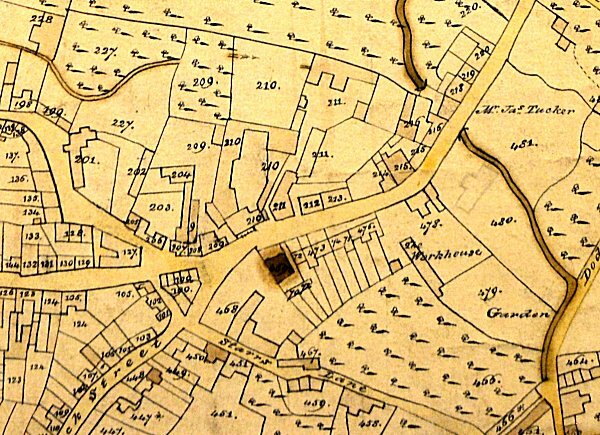 The 1886 Ordnance Survey showing Mars House and its large garden at top left on the corner of Stars Lane and South Street. Behind Mars House, at the end of Raymond's orchard, were what were described in 1869 as "newly erected wool stores" which were in the occupation of Raymond's son-in-law, Benjamin Chaffey. 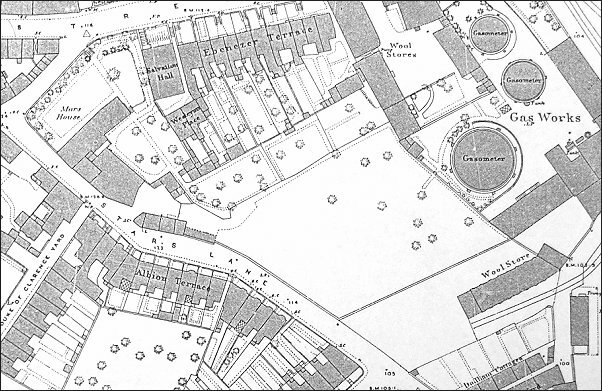 The large empty space at the centre of this map was an orchard that was also owned by Edward Raymond and the wool store, at bottom right, was built in a sectioned-off part of the orchard. The wool store was later used as the premises of scrap merchant and Mayor of Yeovil, Ernest Farr. 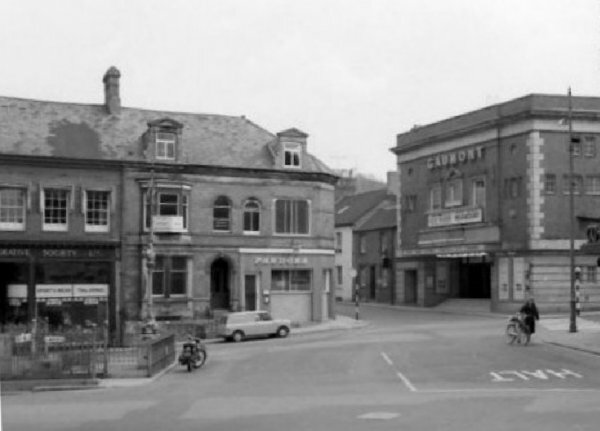 A 1960's photograph of the Triangle with the entrance to Stars Lane flanked by the Gaumont cinema and Pandora's café. Before about 1900 the whole of the left half of this photograph would have shown the front gardens of Mars House with the house itself set back behind them.